03.06.2018: Tony Bates and Daniel Gaunt have claimed an incredible victory in a drama-filled Phillip Island 101 at Round 4 of the CAMS Australian GT Championship. Tony Bates and Daniel Gaunt have claimed an incredible victory in a drama-filled Phillip Island 101 at Round 4 of the CAMS Australian GT Championship. The KFC/Ctech Laser/Moveitnet/B&B backed pair emerged victorious after two race suspensions and a late safety car, heading the pack by 4.1 seconds at the end of 78 laps. Starting from the outside of the second row, an excellent opening stint from Bates saw Gaunt take control with 50 laps in the books. Sixth when he climbed aboard, Gaunt charged his way into the lead just two laps later as those around him stopped, controlling the race to the chequered flag. The GT4 class was taken out by the all-American pairing of Daren Jorgensen and Brett Strom in the RHC Jorgensen - Strom by MARC Cars BMW M4 GT4. They fended off David Crampton and Trent Harrison in their Vantage Freight/M Motorsport KTM X-Bow GT4 by just 0.2s in a thrilling finale, the BMW duo having headed the class battle throughout the race. A crash for Saturday’s Trophy Series sensation Rio Nugara on Lap 39 initially drew the safety car as the Hogs Breath Café/Griffith Corporation Ginetta G55 GT4 found the tyre wall at Lukey Heights, before officials elected to suspend the race. Glen Wood and Vince Tesoriero were also retirements after their Forum Group/M Motorsport KTM X-Bow GT4 tagged the wall at Turn 1, the class leading JMG/Bilstein Aston Martin Vantage GT4 of Jeremy Gray and Andrew Miedecke replicating the KTM seconds later. It saw officials again suspend the race to affect repairs to the tyre barrier, setting up an incredibly dramatic finale. The pole sitting Hot Wheels Car Care Products Porsche 911 GT3 R of Liam Talbot and John Martin had dominated proceedings until a late incident changed the complexion of the incredible race once again. The Walkinshaw GT3 entry was forced out on Lap 62 which it picked up damage to the radiators after running wide at the first turn. It was a devastating end for the team having earlier watched Martin’s mesmerising opening stint which saw him more than two seconds a lap faster than his rivals. The Eggleston Motorsport Mercedes-AMG GT3 also looked a strong contender for the race win, holding a lap advantage before a late penalty saw Peter Hackett and Jake Fouracre home in eleventh. Through the drama, Bates and Gaunt proved a rock solid combination, using the car's pace coupled with the right strategy calls throughout what proved to be a time-certain race to see the chequered flag first. It’s a result that rockets Bates to the top of the CAMS Australian GT Championship points standings. As the race also formed part of the CAMS Australian Endurance Championship, Bates and Gaunt also received a hefty 300-point boost in their title hopes on that front. 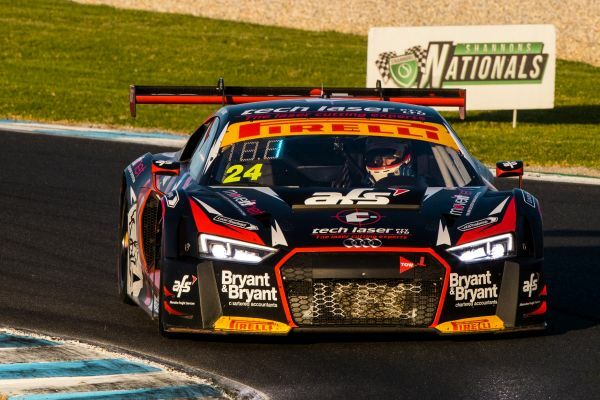 The Audi pair now sit third in the Australian Endurance Championship standings, just 42-points away from Tony D’Alberto and Max Twigg, who safeguarded their points advantage with another stellar drive to the podium. The WM Waste Management Mercedes-AMG GT3 pairing crossed the line third, their fourth consecutive podium in the competition, an incredible run of results that stretches back to Hampton Downs at the tail end of the 2017 season. Second place went to the BMW Team SRM M6 GT3 piloted by Steve Richards and Michael Almond after a faultless performance from both drivers. An impressive opening stint for Almond saw the BMW in contention throughout the race before Richards picked off his rivals to record the squad’s second successive Australian Endurance Championship podium. They now trail Twigg and D’Alberto by 36-points with one Australian Endurance Championship round remaining. The CAMS Australian GT Championship now heads to Sydney Motorsport Park on August 3-4, before the season finale in Hampton Downs in October. The Hampton Downs event will double as the third and final round of the CAMS Australian Endurance Championship, setting up an exciting climax to the 2018 season.